"The World Bank's mission creep"
"With a friend like Fox"
"Caspian energy at the crossroads." No clue? Don't feel bad. You would have to be suffering from acute foreign-policy wonkiness to recognize the table of contents from the September/ October 2001 issue of Foreign Affairs, the flagship publication of the Council of Foreign Relations. Like the "curious incident" described in the Sherlock Holmes tale — that the dog didn't bark — the significance of these headlines is not in what they say but in what they don't say: The nation's leading journal of international relations was paying no attention to the threat from Islamist terror even as Islamist terrorists were planning the deadliest attack ever committed by foreign enemies on US soil. 2. Which US senator admitted on 9/11, "We have always known this could happen. . . . I regret to say — I served on the Intelligence Committee up until last year. I can remember after the bombings of the embassies, after TWA 800, we went through this flurry of activity, talking about it — but not really doing the hard work of responding." That was John Kerry on "Larry King Live," ruing his and his colleagues' pre-9/11 failure to give the threat from international terrorism the attention and "hard work of responding" it deserved. 3. President Clinton's final national security policy paper, submitted to Congress in December 2000, was 45,000 words long. Yet which international menace was never mentioned? Al Qaeda. The document referred to Osama bin Laden just four times, and its discussion of terrorism spoke not of wiping out the killers in their nests but of extraditing "fugitives" to make them "answer for their crimes." Which brings us back to Rice's appearance last week. 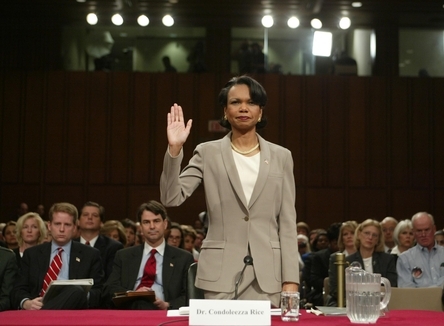 National Security Advisor Condoleezza Rice is sworn in to testify before the 9/11 commission. If anything has been obvious since 9/11, it is that the government of the United States, like the foreign-policy establishment generally, was grossly derelict in its understanding and handling of Islamist terrorism. That was true during the first eight months of the Bush presidency and it was true during the preceding eight years of the Clinton presidency. For all the atmospherics of the Sept. 11 Commission, for all the partisan skirmishing of its Democrats and Republicans, there was no important difference between the two administrations prior to that terrible day. Rice's efforts to prove otherwise were largely unconvincing. So, a week earlier, were Richard Clarke's. The simple truth was put bluntly by Rice in her opening statement: "The terrorists were at war with us, but we were not yet at war with them. For more than 20 years, the terrorist threat gathered, and America's response across several administrations of both parties was insufficient." Democracies rarely face up to the worst dangers they face until disaster strikes. Until then, political leaders find it much easier to do nothing than to press for unpopular reforms. Imagine the backlash the administration would have faced, for example, if it had reacted aggressively to the CIA briefing in August 2001 that warned of possible terrorist hijackings — the one ominously titled "Bin Laden Determined to Attack Inside the United States." If the Transportation Department, on the strength of that warning alone, had ordered air travelers to arrive at least two hours before their flights, banned a long list of common household objects — knives, knitting needles, scissors — from airplanes, and authorized pilots to eject "Middle Eastern" ticketholders they deemed suspicious, the public would have reacted with fury. And the administration would have backed down. Prior to 9/11, no president from Jimmy Carter through George W. Bush properly understood the swelling danger of Islamist terrorism. None recognized that we were under attack by a ruthless enemy bent on global conquest and the destruction of Western liberty. Neither did leaders in Congress, nor elite opinion makers in the media. Far more significant is what has happened since 9/11: The Bush administration went to war. It destroyed Al Qaeda's base in Afghanistan, toppled Saddam Hussein's dictatorship, turned Pakistan into a terror-war ally, and intimidated Libya into ending its hunt for nuclear weapons. Crucially, it has demolished the perception of America as — in bin Laden's words — a "weak horse" that bolts at the first gunshot. And it did it all in the face of withering political fire at home and abroad. How you regard that performance — as invaluable wartime leadership by the president or as a fraud "made up in Texas" — is likely to decide how you vote this November. For what matters now isn't who was wrong before 9/11. It is who has been right since.